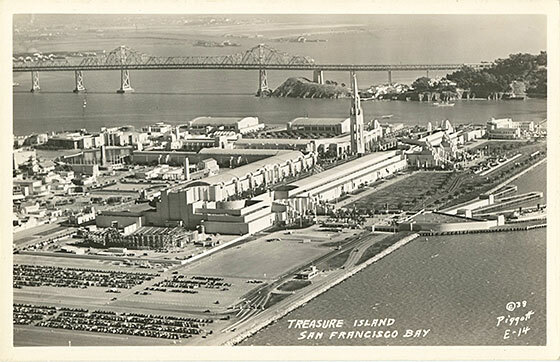 Man-made Treasure Island was dedicated on August 26, 1937. 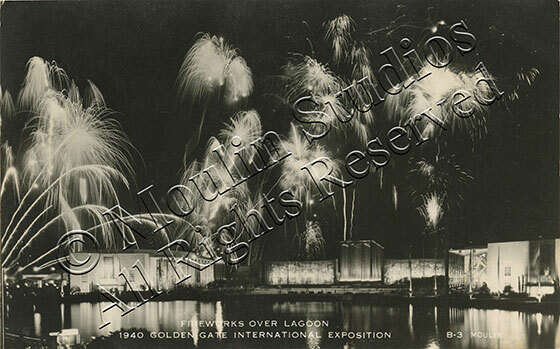 The Western Gate was constructed of a series of wind baffles, small walls arranged in a semi-circle to allow entrance while keeping the wind out. 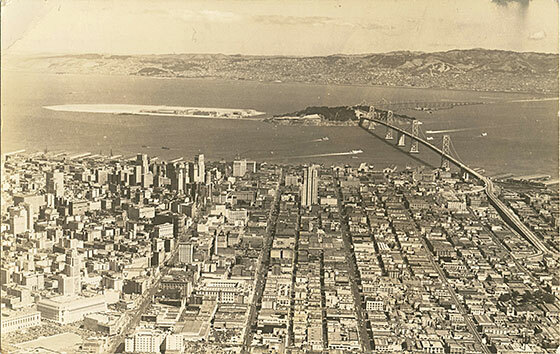 The Elephant Towers stood on either side. This entrance, which passed into the Court of Honor at the base of the Tower of the Sun, was used only by bus and taxi passengers. 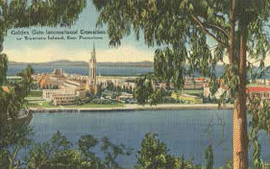 A similar set of wind baffles was constructed for passengers arriving from San Francisco by ferry. 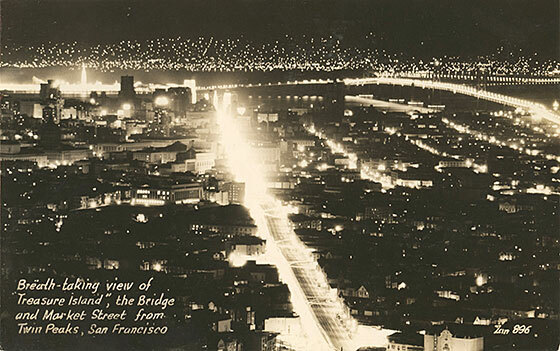 Postcard shows the illumination of Market Street, the San Francisco-Oakland Bay Bridge, and Treasure Island with the Tower of the Sun. Federal Building in the background. 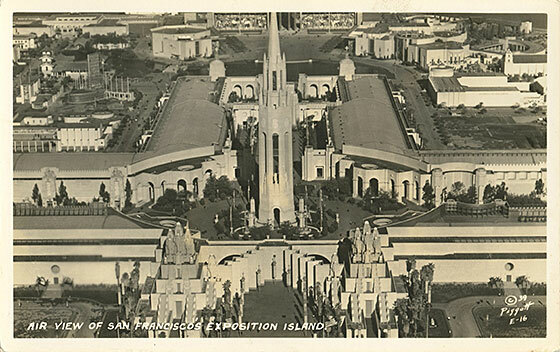 prior to construction of the fair buildings. 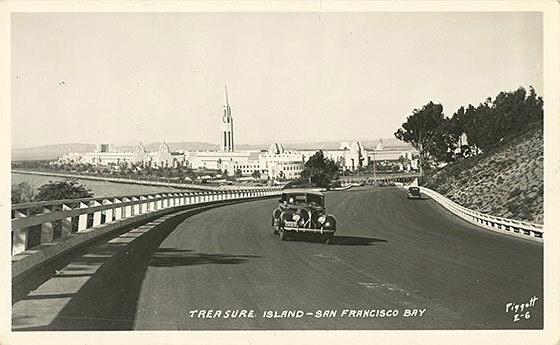 The on-ramp leading to Treasure Island from the San Francisco-Oakland Bay Bridge is still in use today. 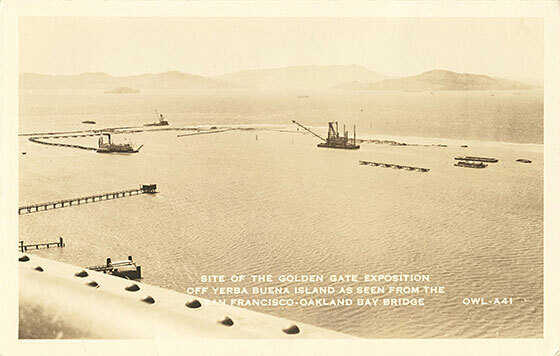 Perhaps the earliest postcard issued for the Golden Gate International Exposition, shot from the San Francisco-Oakland Bay Bridge, shows the dredging machines and temporary sea walls as construction for Treasure Island was just beginning. Looking southwest, with Yerba Buena Island and the San Francisco-Oakland Bay Bridge in the background. The parking lot at the northern end of the island held approximately 12,000 cars.